It sounded like an answer by committee, something a group of franchise owners along with their public-relations minions carved, sculpted, and burnished to group-tested perfection. 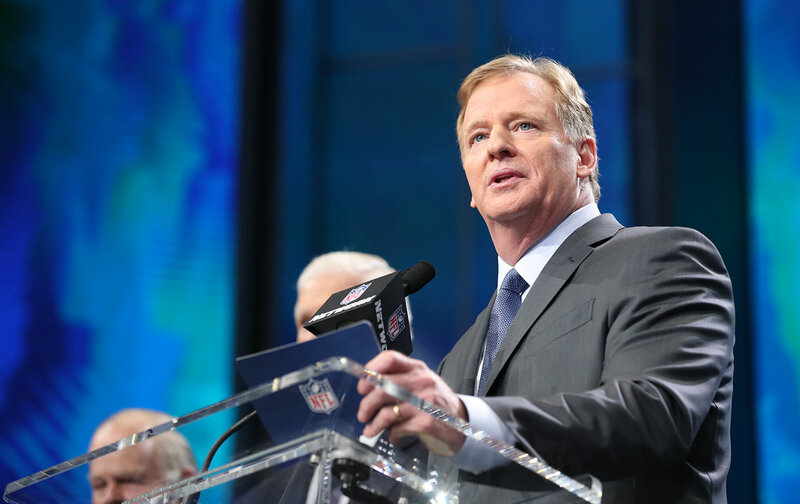 Once it was shined up real nice, the words were placed into the mouth of National Football League Commissioner Roger Goodell—aka Commish-Bot 3000—to be put out into the atmosphere. Goodell was asked twice at his annual “state of the NFL” press conference about the league’s alleged collusion against Colin Kaepernick—its willingness to keep the quarterback off the field because he dared to protest police violence and racial inequity during the playing of the national anthem. This is such unmitigated garbage. Quarterbacks like Tom Brady and Aaron Rodgers have gone on record to say that Kaepernick should be on a team; so have top coaches like John Harbaugh and Pete Carroll. Kaepernick’s unemployment is no mystery. In his career, Kaepernick has thrown for 72 TDs and only 30 INTs. In his last season back in 2016 with the 49ers, he had 16 passing TDs and only four INTs, while leading the league in yards per carry. Goodell’s job is to provide legal boilerplate in situations such as this and not give Kaepernick’s attorneys any more ammunition in their collusion case against the league. His duck-and-cover on this issue is an ugly echo from the past. It was 1942, as New York Daily News columnist Chuck Modiano pointed out, when Major League Baseball Commissioner Judge Kenesaw Mountain Landis said, “Negroes have never been barred from organized baseball & never have been in the 21 years I have served.” This was a lie from Landis, who had upheld the “gentleman’s agreement” to keep “Negroes” out of the national pastime from the day he became the league’s first commissioner. If a team wanted to get better, they would sign Colin Kaepernick. Full stop. That none has is a testament to the racism of league owners in a time with the fewest number of black head coaches (three out of 32) in years. It’s a racism that leads them to give 8$ million to Donald Trump, while pocketing millions off of the sweat of black labor and the wreckage of black bodies and minds. Roger Goodell, like Judge Landis, is fronting for racism. That will be his legacy, unless he somehow sprouts a backbone before retirement.